Reel in a tagged red snapper this summer and you could trade the yellow metal label to the federal government for $250 to $500 if your fish has two tags. The Great Red Snapper Count is part of a $10 million incentive program awarded by the Mississippi-Alabama Sea Grant to gather information about the red snapper population to be used to determine the annual harvest season for 2020. Last year’s red snapper season, which typically begins on June 1, was 82 days for anglers on private boats. The season for charter and party boats was shorter. The Gulf of Mexico Fishery Management Council, which operates under NOAA and the U.S. Department of Commerce, will return next year to determine season lengths based on the harvest numbers from the previous year. Last year and this year, those determinations were made by the five Gulf states — Texas, Louisiana, Mississippi, Alabama, and Florida — as part of a two-year pilot program. According to the Texas Parks and Wildlife Department, which helps gather information and enforces fishing regulations, this year’s season could stretch to 97 days, although not necessarily consecutive days. The research is headed by Greg Stunz, director of the Center for Sportfish Science and Conservation at Texas A&M University-Corpus Christi. He also holds the Endowed Chair of Fisheries and Ocean Health at Harte Research Institute for Gulf of Mexico Studies. Stuntz and his team will tag 4,000 fish in April, which they will then release at the beginning of the fishing season. The release will happen along the entire coastline of the Gulf of Mexico. 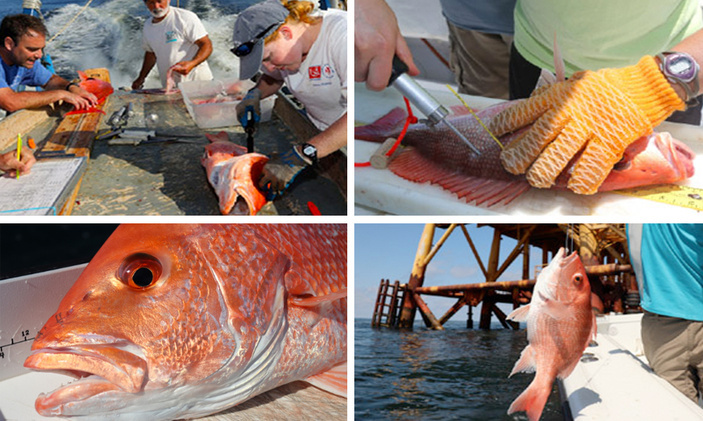 Formally titled “Estimating the Absolute Abundance of Red Snapper in the U.S. Gulf of Mexico,” the study is separate from the assessment process employed by the fishery management council. Counting methods will include habitat classification, direct visual count, and depletion surveys as well as the tagging. To collect the money, anglers will need to report the port of origin, the date of the catch, fish length and weight, and location of catch. Tags can be mailed in or sent as a photograph. One of the most regulated fish in the sea, red snappers are popular among anglers for their sport and taste.